A raid on a marijuana dispensary in Long Beach was caught on video showing officers smashing surveillance cameras and stepping on a suspect, moves that prompted accusations against the officers of excessive force. More than a dozen police raided THC Downtown Collective in the 300 block of Atlantic Boulevard (map) on June 19, officials said. 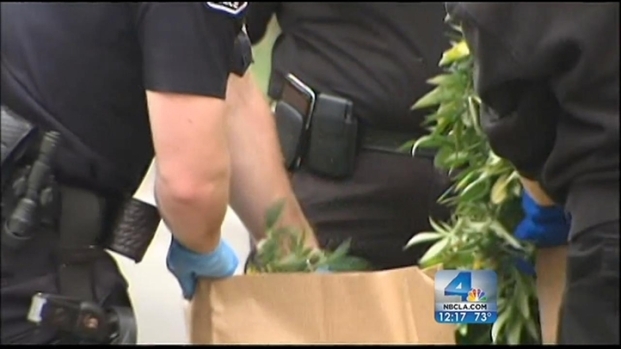 The video was posted to YouTube by user "Long Beach Raids" on July 1. Officials said they learned about the video on July 3. The two-minute-long video (below) opens to show a man surrendering to police, three of whom surround him while two put him in handcuffs. One of the officers is seen stepping on volunteer employee Dorian Brooks' back with both feet before stepping on his neck, with what Brooks described as 300 pounds of pressure. The video, which was being recorded at an off-site location, then cuts to an officer pointing at the recording camera before another looks up and smashes the lens. "They noticed there was a camera that was on the wall right above my head, so they proceeded to smash it with a metal rod," said Brooks, adding that the camera shattered on him. "I wasn't able to protect myeslf because my hands were cuffed." Authorities describe what they found inside a building that housed a sophisticated marijuana growing operation. Toni Guinyard reports from Placentia for the NBC4 News at noon on Tuesday July 3, 2012. "I felt violated; I felt disrespected," Brooks said. The video cuts again and reopens on a man donning a tshirt and backwards baseball cap with what appears to be a badge hanging from his neck. 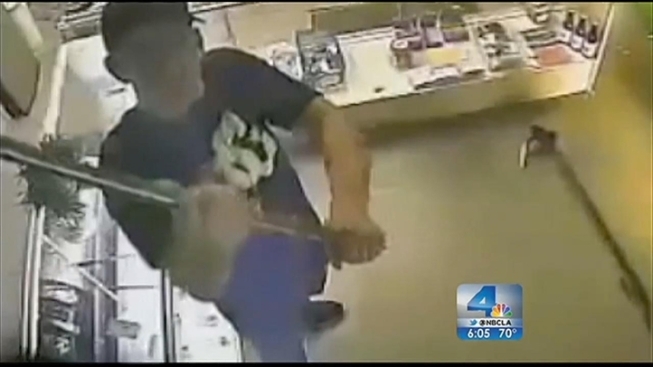 This man, apparently behind the dispensary’s counter, also smashes the recording camera. Footage from after the raid shows a disheveled room, with portions of the ceiling removed and scattered on the floor, strew with boxes, electrical cables and other objects. Dispensary employees claim the raid caused tens of thousands of damage, and police took the collective's ATM and cannabis. "A thorough review into what occurred during that operation will be conducted once all of the facts have been collected. This is a personnel matter and we are unable to discuss any further details," Lisa Massacani, with LB police, wrote in a statement. Police said the dispensary was operating under state compliance, but did not have a city permit.